Town in the ancient province of Dauphiné, France. As early as the fifteenth century it had an important Jewish community. 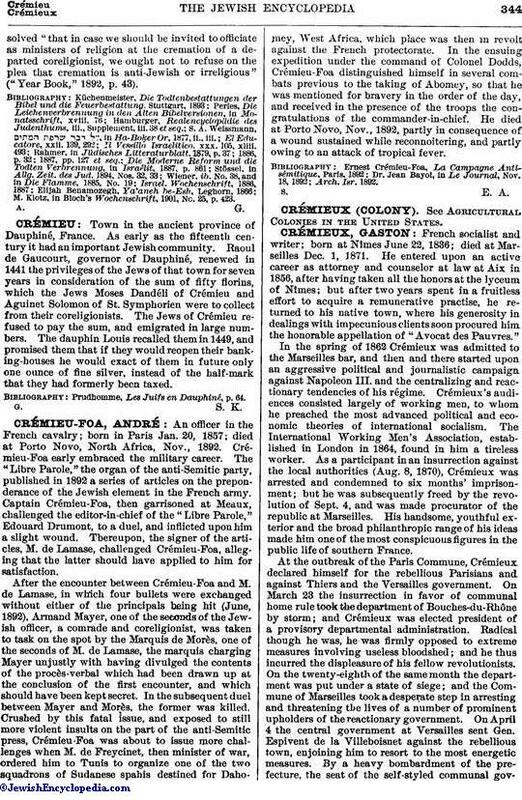 Raoul de Gaucourt, governor of Dauphiné, renewed in 1441 the privileges of the Jews of that town for seven years in consideration of the sum of fifty florins, which the Jews Moses Dandéli of Crémieu and Aguinet Solomon of St. Symphorien were to collect from their coreligionists. The Jews of Crémieu refused to pay the sum, and emigrated in large numbers. The dauphin Louis recalled them in 1449, and promised them that if they would reopen their banking-houses he would exact of them in future only one ounce of fine silver, instead of the half-mark that they had formerly been taxed. Prudhomme, Les Juifs en Dauphiné, p. 64.